Few things can kill a customer’s image of a company more quickly than being put on hold in dead silence. And if you don’t have a phone system, then you most likely don’t have an on hold message and music recording. Fortunately, not having a phone system is no longer a problem. A music on hold adapter allows you to play on hold message and music recordings on any phone – even your home phone! Imagine that. Sounding like a Fortune 500 company while working out of your basement or small office. This system connects directly to your telephone lines and can be used by all of your phones on the same lines. You can place someone on hold through a music on hold adapter on one phone and pick them up on a different phone without hassle. A music on hold adapter can handle two to four lines, to give you music on hold ability for your KSU-less phones, providing you with as quick and painless a connection of this system, as possible. This unit provides excellent audio quality via a built-in audio player or receive audio from another source through an industry standard RCA audio jack. 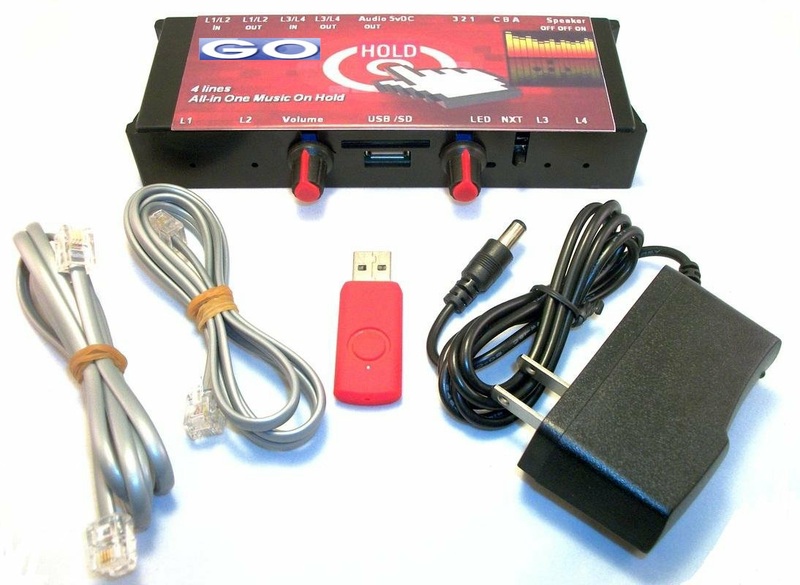 A music on hold adapter from GO On Hold is much better than most any other telephone Music On Hold adapter currently on the market, short of buying an expensive telephone KEY system. Now any business, regardless of size, can sound like a corporate giant, and connecting a music on hold adapter to your phones is as simple as hooking up an answering machine. It can be done and it is surprisingly affordable. In the past, only businesses with a PBX or KEY phone system could have an on hold music and message recording. Not anymore! A music on hold adapter has an integrated analog adapter module which allows any and all of your phones to provide on hold audio content to ordinary analog and “KSU-Less” phone systems. Currently, when a caller is placed on hold with an ordinary phone, that call is routed back to your phone company. And there it sits. You know the rest – that important caller to your business is forced to suffer in silence, wondering if they are still connected. With a music on hold adapter, the call is intercepted. Instead of silence, your caller on hold hears your commercials on hold that is activated by pressing the Flash button on your telephone, then the hold button. A music on hold adapter supports up to four incoming lines and provides audio messaging and music solutions on all of your office phones. Another option for small businesses with only one to four phone lines looking to add music on hold capability is to replace your phone(s) entirely. 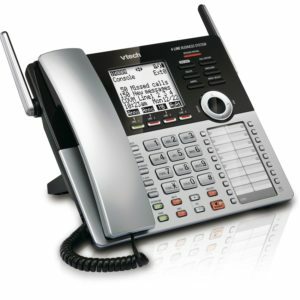 The VTech CM18445 4-Line Expandable Small Business Office Phone with Answering System features a Music-On-Hold Input, allowing you to connect any audio device, including the USB-50 Music On Hold Player from GO On Hold, that plays messages with music for your callers with true hold-button activation. Using the audio cable that is included with the VTech CM18445 phone, connect one end to fit the RCA jack on the USB-50 or other MOH device and then scroll through the phone settings to select the external music feed as the source your callers will hear when placed on hold. For the phone music on hold to be heard by callers placed on hold, you only need to press the hold button (no * or flash) and the base station, cordless desk set and wireless hand sets all play the music to callers on hold.